Low sun, incredibly, forced the cancellation of two races at yesterday's KDM Hire Cookstown 100. The only race to take place after qualifying was the Greenvale Hotel Senior Support 'B' race won by Ballymoney rider Tommy Henry on his O'Kane 600cc Yamaha from English visitor David Murphy and John O'Donovan from Co Cork. Earlier in the afternoon all eyes had been on the debut of Michael Dunlop on the Tyco BMW Superbike he is set to race at the major international meetings this season, but Dunlop, despite having set the fastest time in his Superbike Group of 1m 25.719secs for the 2.1mile Orritor Circuit, was upstaged by last year's Cookstown Man of the Meeting Derek McGee (Kawasaki) and Michael Sweeney (BMW) in the second group of Superbikes, with laps of 1m 25.471secs and 1m 25.666secs respectively. Dunlop's time came after he cruised around in his early laps before pulling the pin on lap six to set the marker before McGee and Sweeney set their times also on their sixth laps. There was drama for one of today's favourites Derek Sheils, who had his Cookstown BE Suzuki suffer mechanical gremlins on the opening lap of practice, and he was forced to revert to his Supersport Yamaha on which he recorded the twelfth fastest speed that will see him start from the second group of riders in the Open and Feature races to day. 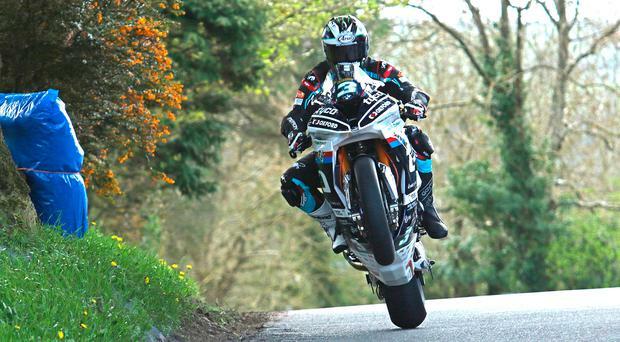 However, he is still capable of causing an upset and can win from the second group on corrected time as has been proven on many occasions at Cookstown. McGee and Dunlop will have to keep a wary eye on their respective pit boards. James Cowton, Brian McCormack, William Dunlop and Adam McLean are all well capable of causing an upset in the Superbike races today. In Supersport qualifying, Sheils made no mistakes and topped the leader board a mere 0.095sec ahead of Tobermore rider Adam McLean, who had gathered himself and the McAdoo Kawasaki up after a spill to start from the front row alongside Sheils and McGee with Cowton and the two Dunlop's fifth and sixth on the grid and Sweeney seventh. Supertwin will see McLean start from pole today alongside Cowton and double Support champion from 2017 Joseph Loughlin from Castleblaney. Thomas Maxwell is an excellent fourth while circuit newcomer Davey Todd was equally impressive in fifth position on his Cookstown BE Kawasaki. In the Lightweight Supersport class, two Ballymoney riders Darryl Tweed and Seamus Elliott sandwich English visitor Alistair Haworth on the front row with the two Stephens - McKeown and Morrison - fourth and fifth and Michael Rees from Wales completing the top six. Mullingar man McGee was also fastest in the Moto3 class from McLean, Robinson and Paul Jordan while Loughlin was the top 125GP runner in the jointly ran class. Richard Ford and Barry Davidson topped the Senior Classic classes, Ford fastest in the 1000cc class and Davidson topping the 500cc class. Davidson was also fastest in the Junior 350cc Junior Classic with Brian Mateer heading the 250cc classic brigade. Michael Brown from Co Cork set the standard in the Senior Support class with a 1m 31.491sec lap 0.604sec clear of Ballyclare's Darren Keys and Scottish visitor Steven Haddow while it was Co.Meath rider Barry Sheehan fastest in Junior Support from Kildare's Jason Cassells and Cumbrian Alistair Haworth. The day's racing sees the roads close this morning at 10am ahead of a 20-race programme.